There are certain places in the world whose names, for whatever reason, conjure up images of remote wilderness and mysterious lands that modern civilization has yet to take over: Timbuktu. Kathmandu. Deepest, Darkest Peru. Pretty much any place that ends in a "u", apparently... But also Albania. I admit to knowing absolutely nothing about this country, except that it sounds remote and mysterious. Surprisingly, Neda also had little to offer despite her living just a few hundred kms away. 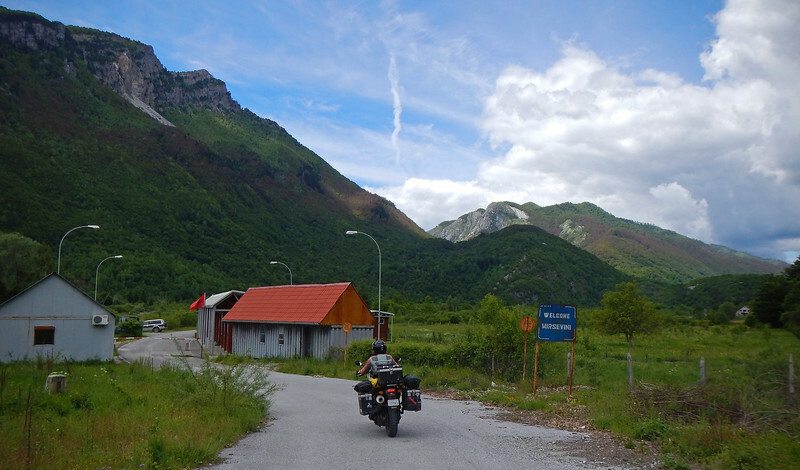 We're starting fairly early because there are a couple of unknowns for the day: a border crossing and some variable terrain ahead of us. The morning weather is a bit chilly up here in the mountains, but it's looking to be yet another nice day for riding! 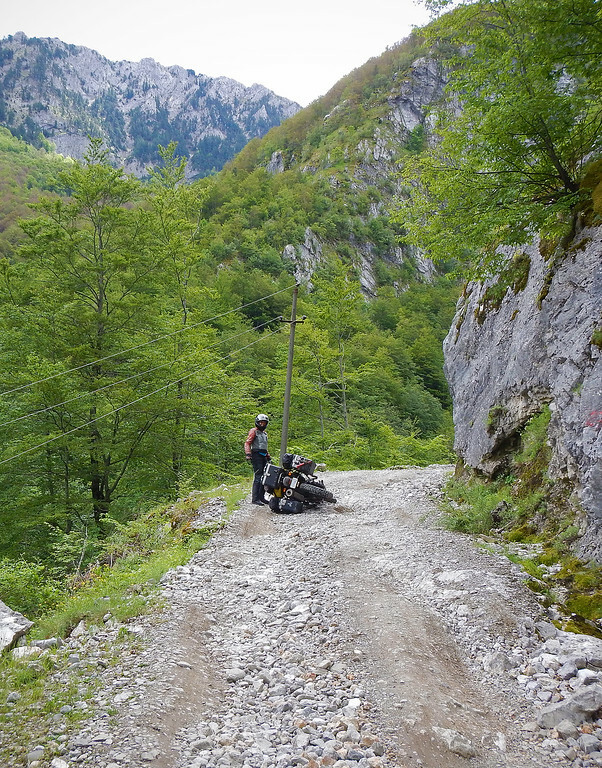 7 kms later and we find ourselves stamping out of Montenegro. This is the last time Neda will use her Croatian for a while. 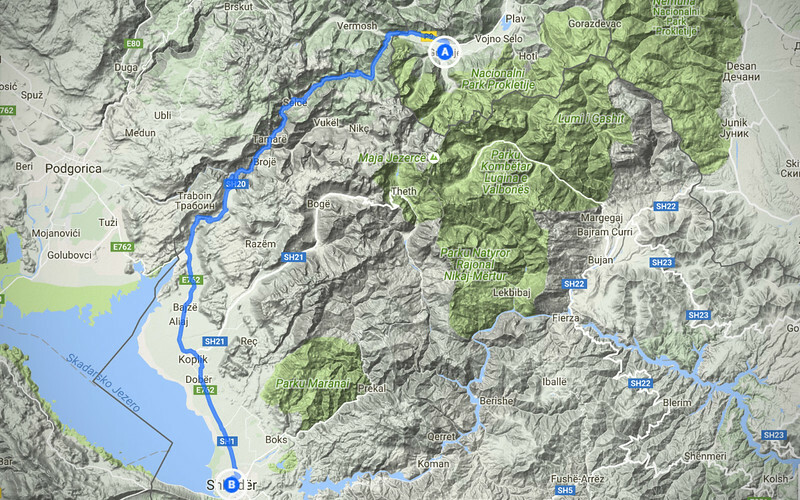 In No Mans Land heading to the Albanian side of the border. Mirsivini! Our first Albanian word! 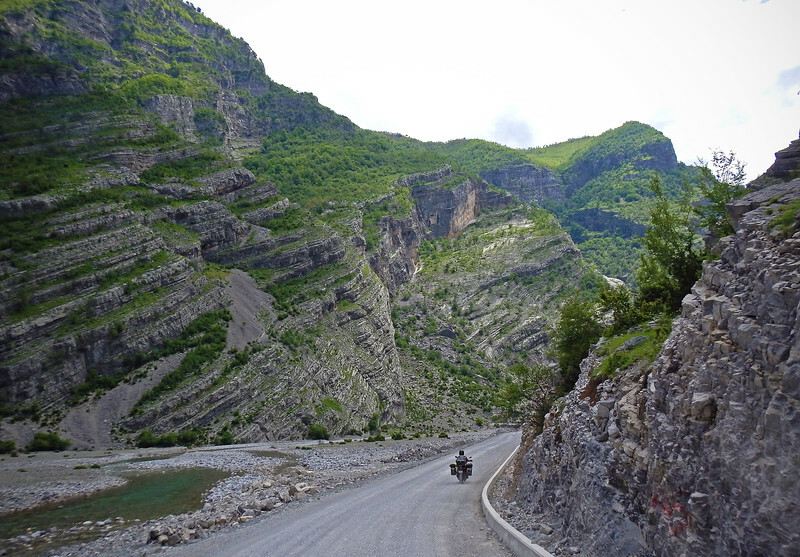 We read up on Albania last night and the language has no relation to any other in the world, it is it's own branch. 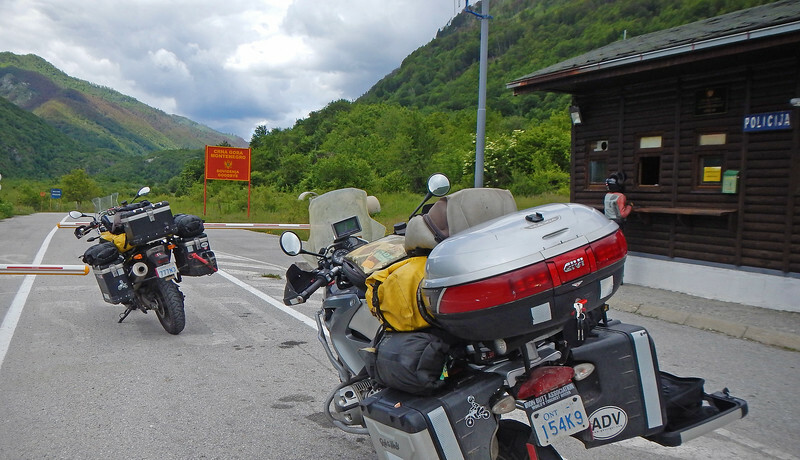 The guys at the Albanian side speak a little bit of English and they are very curious about our bikes. I don't think there are a lot of people crossing the border up here in the mountains. The main highway is closer to the coast, and these border control buildings look more like shacks! 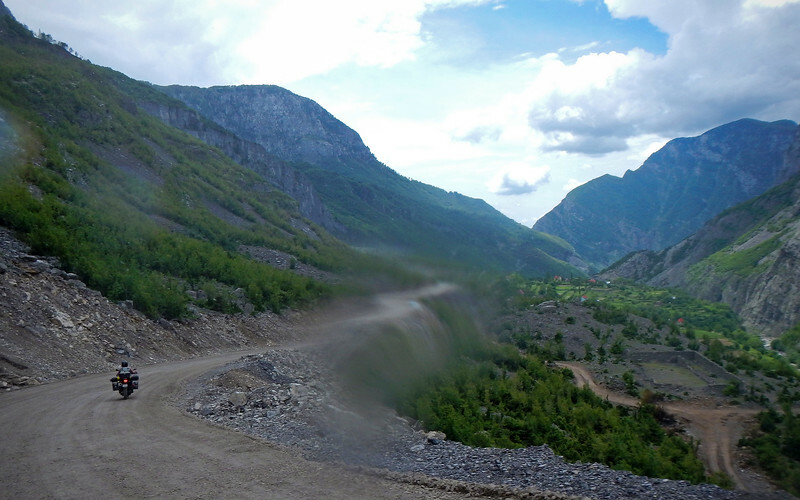 And not 100 meters after the Albanian border, the road turns to gravel. 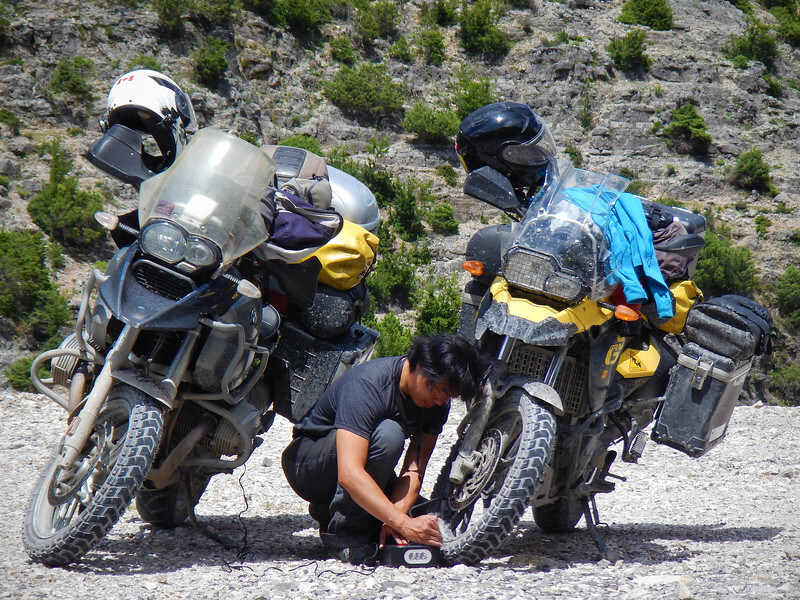 We stop to air down our tires for better grip in the loose stuff. 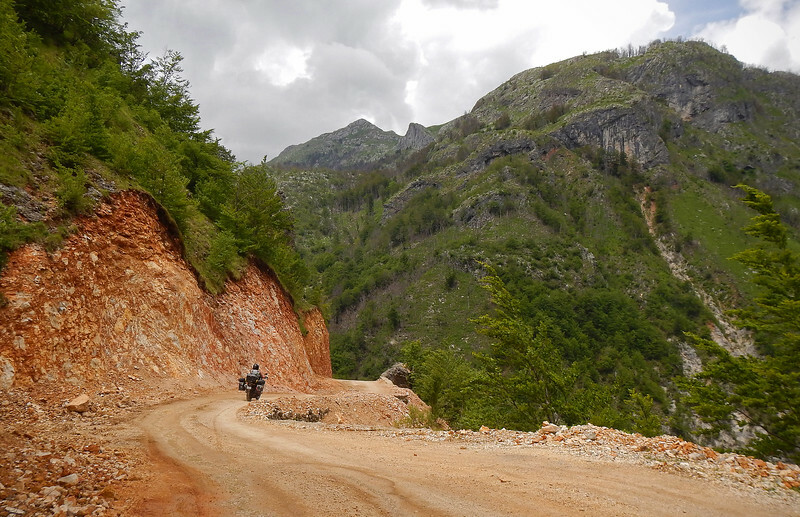 We had read that the roads in Albania were very bad. 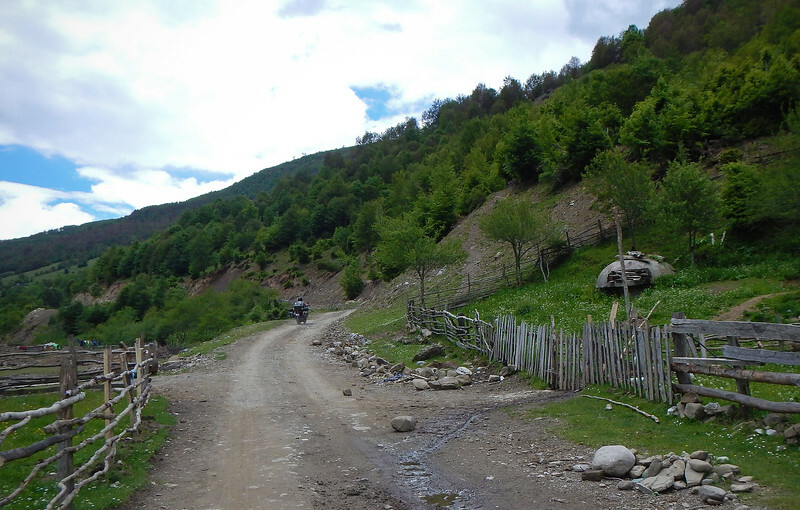 Many of the secondary roads were unpaved and the ones that were were broken and full of potholes. 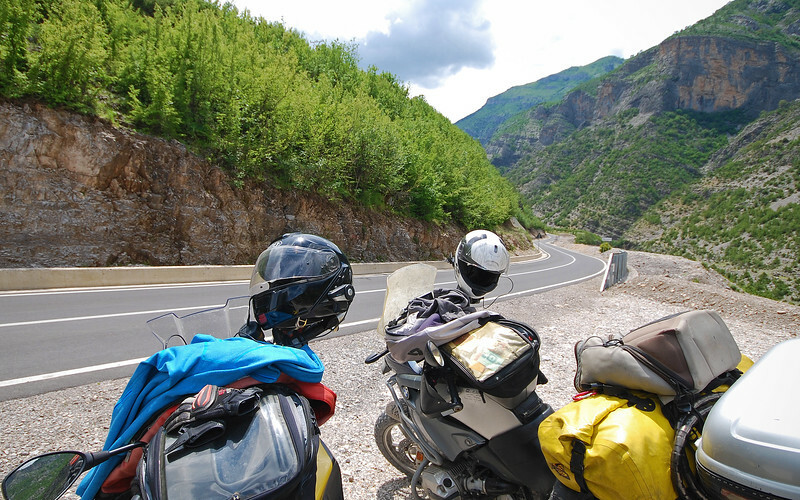 We're prepared for some adventurous riding! These bunkers were built during the communist era, from the 1960s till the fall of the Iron Curtain. The country's dictator at the time, Enver Hoxha, had 750,000 of them built all over the country, even up here in the mountains. We read that on average, there is one bunker for every 5.7 square kms. 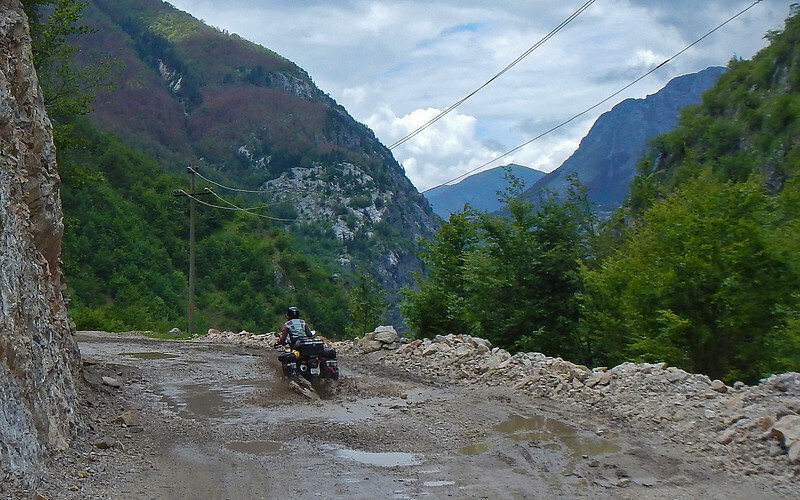 The construction was a huge drain on Albania's resources, taking money away from housing and roads. 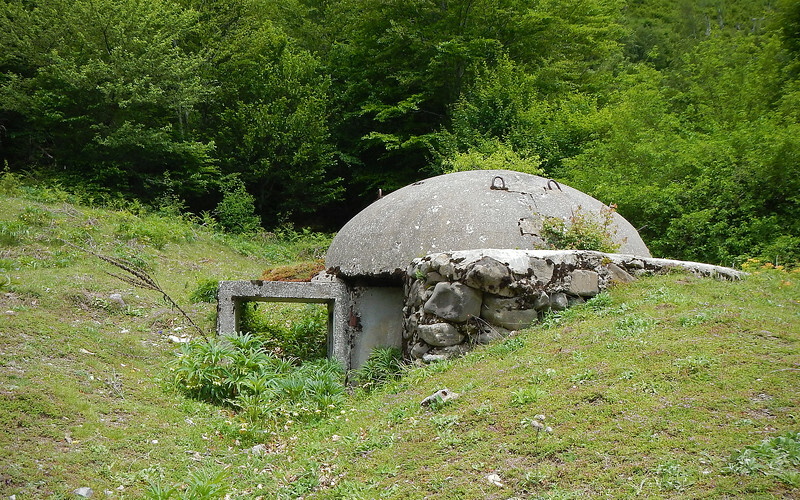 None of the bunkers were ever used for their intended purpose. 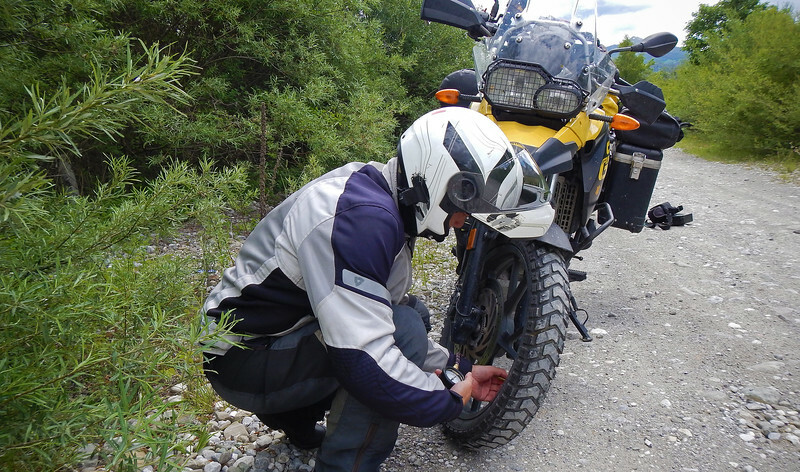 "I'm just going to leave this here for a minute..."
We haven't been doing a lot of off-road riding lately, so we're a bit out of practice. We're only a few kms into the gravelly section and Neda decides to let her bike nap in the dirt. 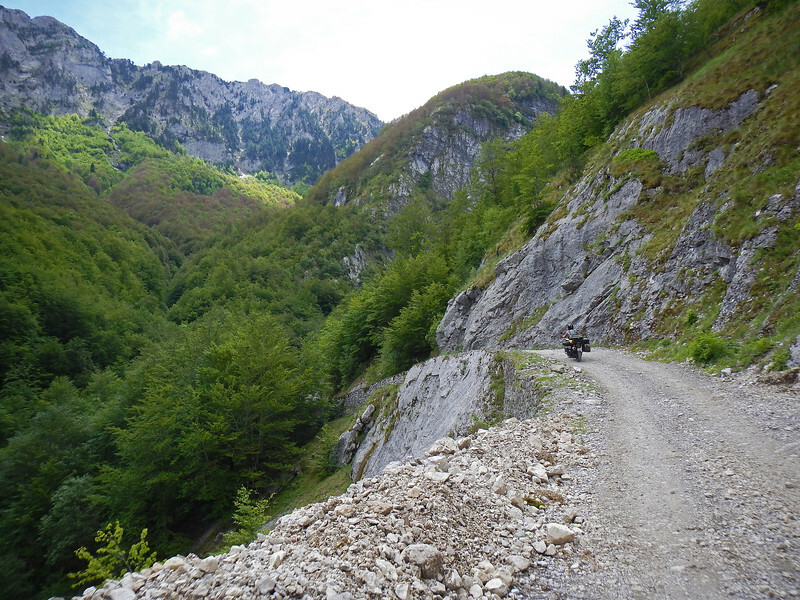 This early section was littered with fist-sized stones and baby-head rocks, so it was a bit challenging while we were in the process of getting our off-road legs back again. We woke Neda's bike up and we're off again! 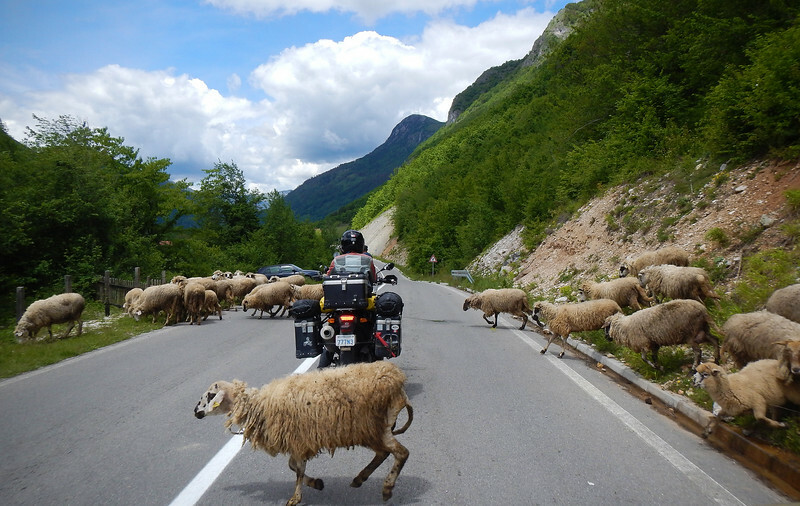 Not a lot of motorized traffic on this road... But plenty of construction though. 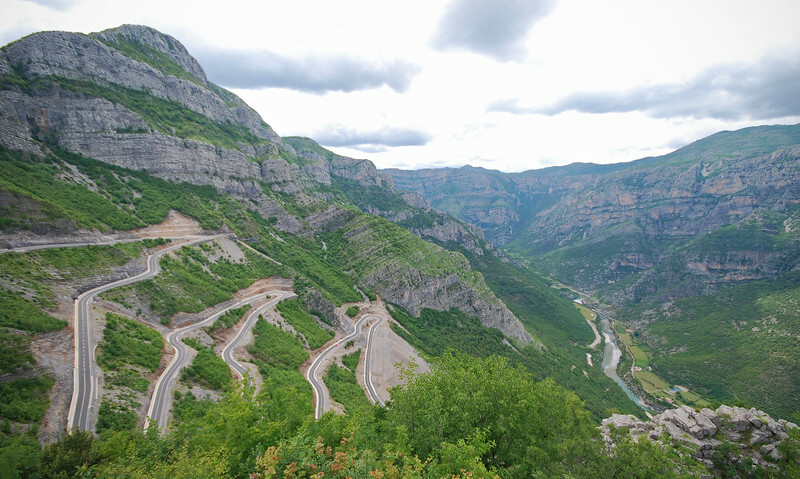 In 2014, the European Union contributed €51 million to refurbishing all the mountain roads in the area. 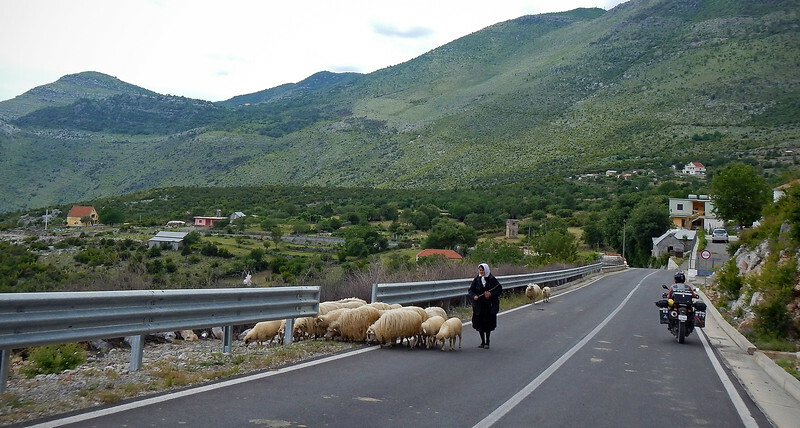 Albania is one of the poorest countries in Europe, and the hope is that improved access to the rural areas will be good for the economy and education - transportation of goods from the farms to the cities, and also busing the kids up here to school and back. Road goes through some farms... and more bunkers. This one was being used as a storage shed! I don't particularly seek out dirt roads. Neda likes them. I prefer going faster on twisty tarmac than having the front wheel constantly pointing in a different direction than where I'm headed. 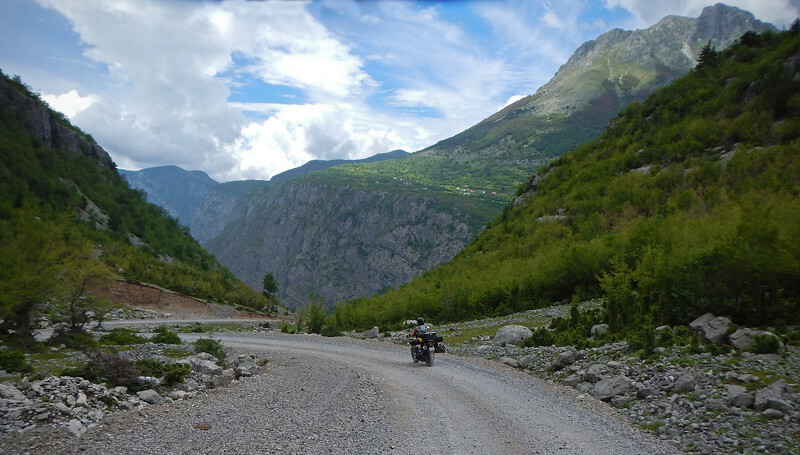 But the nice thing about dirt roads is that they often take you to some amazing places where it's impractical or too expensive to pave over - like these high mountain passes. Also, there are no other vehicles to share the road with. Maybe a horse or two... :) You really feel like you've got the entire place to yourself. And then it rains a bit. I'm worried about the ground beneath us turning into mud... Ack! I hate mud! Big, magnificent landscape all around us! After about 30kms in, the gravel road abruptly terminated into fresh asphalt. It looked brand new, probably courtesy of the EU. That was a very fun ride! I was a bit worried about how long it would take us but here we were at the other end of the dirt road and it wasn't even noon yet! Back on the pavement! Looks like twisties is next on the menu! Yay! Back on the road. There is an awesome staircase of switchbacks heading back down the mountain. We stop at the side of the road to admire the view and a car pulls up beside us. Uh oh... are we blocking the way? There's absolutely nobody else on this road. Probably because it terminates at a dirt road. So when this guy pulls up beside us, I thought he was going to tell us to park somewhere where there was more room. 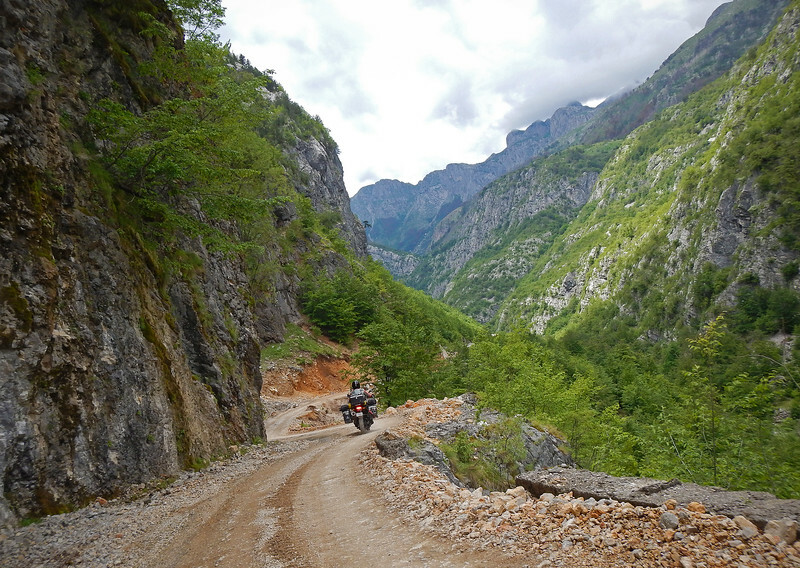 Instead, the guys in the car saw our out-of-continent license plates and they asked what we were doing in Albania. But not in a nasty way. They were genuinely curious why we wanted to visit their country. We motioned all around us and told them, "Your country is beautiful!" They seemed to ponder on this like it was the first time anyone has ever mentioned it. 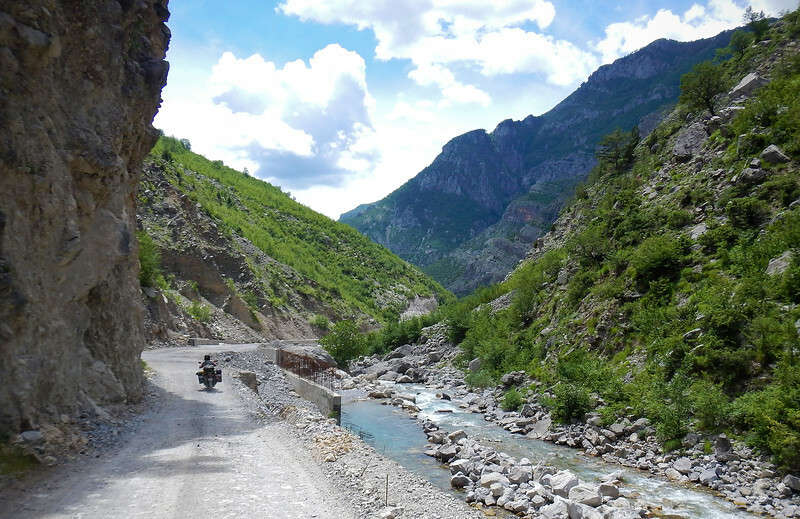 I don't think a lot of tourists come to Albania, which is a shame. After a couple of minutes of chatting right in the middle of the road (traffic is politely routing around us like it's not big deal - What's the Albanian word for "pomalo, pomalo! "), they wish us a friendly farewell. Nice guys! 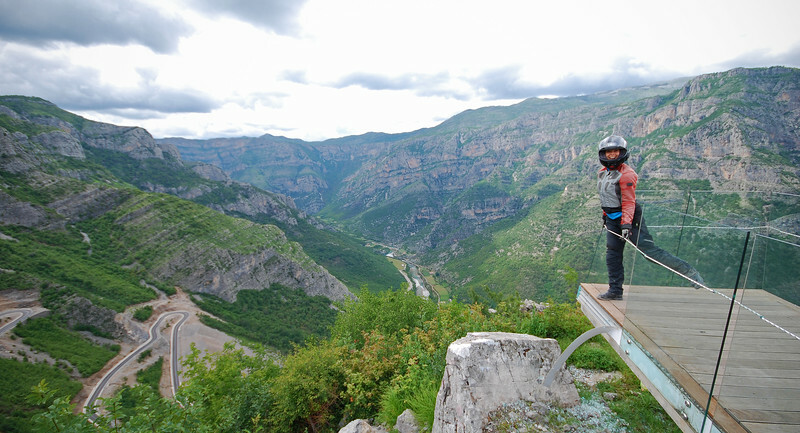 Here's a viewing platform that extends out into the valley. Albanian safety standards. No glass? Rope will do. Check out this amazing road we have ahead of us! More sheep shots at the bottom! Very Albanian! 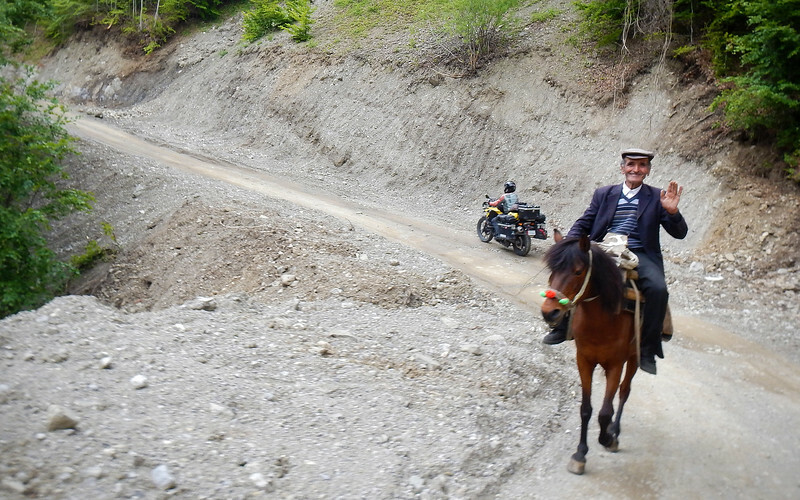 Our first day in this new country has been full of amazing riding and friendly people! A very good impression so far! We can't wait to explore more!